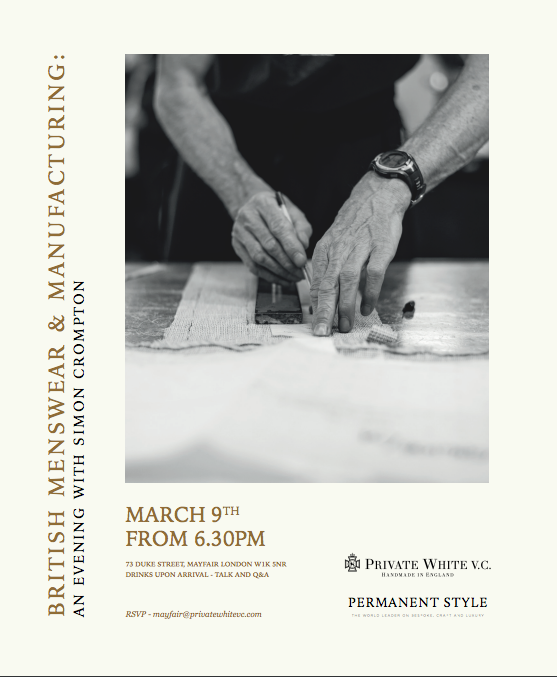 On Thursday this week I will be chairing a talk at the Private White VC store on Duke Street, Mayfair. Featuring speakers from Edward Green, Inis Meain and Alice Made This alongside Private White, the talk will focus on the state of manufacturing today and what it means for modern British brands. Do pop along if you're in the area. It starts at 6:30pm. You can follow the discussion on British manufacturing: A talk at Private White by entering your email address in the box below. You will then receive an email every time a new comment is added. These will also contain a link to a page where you can stop the alerts, and remove all of your related data from the site. On the subject of manufacturing: Why is natural silk thread used in bespoke jacket/suit making rather than other materials? Simon, great piece. Slightly off topic but do you know of a Chinese bespoke maker, a friend had mentioned the name Henry Chan but wasn’t sure of the name, and after doing some research I couldn’t find anything. Does it ring any bells? No, sorry. Perhaps WW Chan? That is the only one I came across. Do they make bespoke for other tailors?